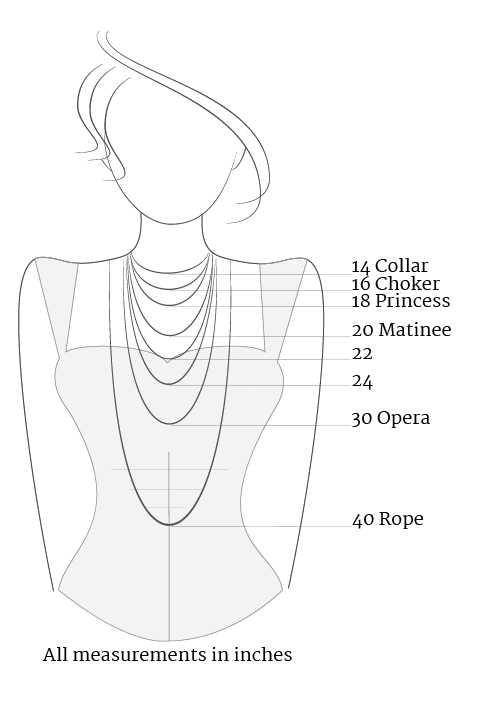 For your convenience, here are some common necklace sizes in both picture and text form. Please keep in mind that these are approximations. Larger women may need longer lengths, and petite ones may need shorter lengths. You can find all my available necklaces here. 14″ | Collar: Fits closely around the neck, like a collar. 16″ | Choker: Falls around the base of the neck. If you have a slim neck it will likely hit your collarbone, while on a wider neck it might fit more like a collar. 18″ | Princess: A common choice for women that will fall just at the collarbone. 20″ to 24″ | Matinee: 20″ Reaches just past the collarbone and allows for some breathing room. 22″ Falls to the top of the bust, above or at a low neckline. 24″ Sits around the center of the bust. 30″ to 36″ | Opera: Will hang below the bust, but above the waist. 40″ and above | Rope/Lariat: Falls to your navel or below. Take a look at my available necklaces.